In giving talks around the country about Desiring the Kingdom, one of the themes I regularly press is the refusal of any form/content distinction when it comes to Christian worship. This is central to my argument: when I claim that Christian worship forms and orients our loves, it's not just any old version of Christian worship that does this. Indeed, much of what evangelicals think of when they think of "worship" (=music) does not have the potential to be formative in this way. What we need is Christian worship that embodies the unique logic of the Gospel, practicing and enacting the specificity of the Christian narrative. This is why, over time, the church, led by the Spirit, has communally discerned a certain given "shape" for core elements of Christian worship (which can then be "indigenized" in different ways in different contexts at different times). The Gospel is not a "content" that can be distilled and just dropped into any old "form" that seems hip or relevant or attractive. You can't distill Jesus from Christian worship and then just drop him into the mall or the coffee shop or the concert: while you might think you're "Jesu-fying" this medium, in fact you just end up commodifying Jesus. As I try to unpack this argument in various contexts, I sometimes allude to Marshall McLuhan's famous claim that "the medium is the message." The intuition is the same: there is no neat and tidy form/content distinction because we can't sort out the message from its medium: the medium is the message. That's not a bad shorthand for the point I'm trying to make--it's just that I think catholic Christianity discerned this long before McLuhan. Turns out, however, that McLuhan's intuitions owe something to Catholic Christianity. When I was staying in Toronto earlier this summer, this was confirmed for me on two separate occasions. First, while visiting my brother and joining his family on a trip to the local library, I sat down with a recent issue of The Walrus, sort of Canada's version of Harper's or The New Yorker. Lo and behold, the issue contained an article by Jeet Heer, "Divine Inspiration," in which Heer unpacks the significance of McLuhan's conversion to Catholicism as the "background" of his theorizing. Fascinating stuff. 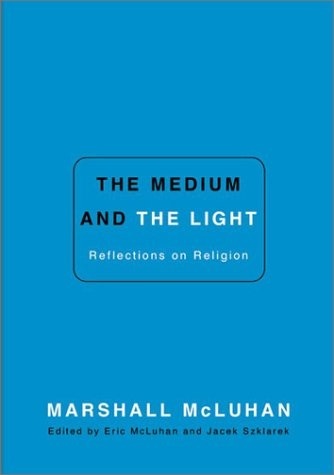 Then just a couple of days later, in a basement bookshop on Bloor Street, I hit upon another little gem (this is why I believe in bibliographical providence): The Medium and the Light: Reflections on Religion which is a collection of McLuhan's essays and interviews on religion, particularly Roman Catholicism, with some illuminating reflections on liturgy in particular.